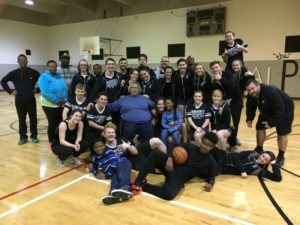 March 11 – 15, 2017, in partnership with Grace Klein Community, the Asbury University Tumbling Team, an acrobatic group, traveled to Birmingham, AL to perform free shows. 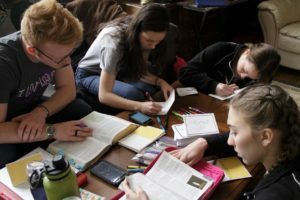 Their desire is to impact younger students by setting an example of how hard work, a strong education, a healthy lifestyle and a good attitude can change the world for Christ. Through the generous donations of partner businesses, friends and family, Grace Klein Community was able to provide food to all 4 host homes accommodating the students during their stay. 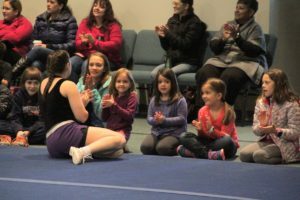 With a full schedule of seven performances and a number of clinics, the tumblers came with hearts ready to love on their audiences, making new friends, and shining Jesus through their words and actions. It was a joy approaching our partner schools, businesses and churches, offering opportunity for shows performed by the team, and even reaching out to schools that had possibly never heard of us. One school in particular were so honored that we would offer their students such an opportunity, and at the convenience of their school building, during school hours. The team performed at Metro CME and their surrounding community, at Seeds Coffee during a fundraiser for Purpose Place Thift Store, at Westbrook Christian School, Seminole Boys and Girls Club, Minor Elementary School, Restoration Academy, and Mighty Oaks Homeschool Co-op during their stay in Birmingham. The team spent their “free time” serving with Grace Klein Community. 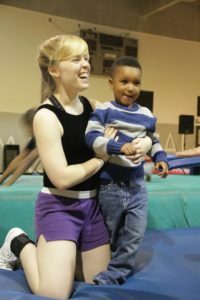 Our first “meet and greet” with the tumblers was at the Grace Klein Community house! We were looking forward to meeting them, as well as showing them the house God provided to be used as a place of respite for traveling missionaries. The team was not afraid to get their hands dirty. After dividing in groups, they began tackling the yard, racking leaves, trimming bushes, and weeding the flower beds, while others assisted with house work. The tall windows were no match for the tumblers, when you are in acrobatics climbing on each others shoulders is really no big deal. 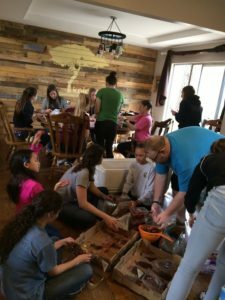 Another team assisted with food preservation, cutting, washing and packaging strawberries for families in need, while others wrote encouraging notes to bless mamas attending a single parents appreciation weekend taking place at Liberty Church. The team completed the tasks at hand just in time before the rains came down, and, their first show in Birmingham! After final clean up, and a quick lunch, the team hit the road for their first performance. 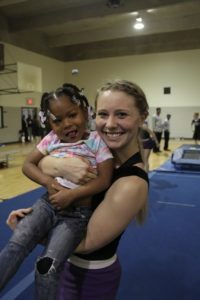 We are so thankful for the Asbury University Tumbling Team for giving us the opportunity to care for your needs during your time in Birmingham, while caring for ours. Spending time with the tumblers in groups, or as individuals, hearing their stories of how they came to be a part of the team, their walks with the Lord, and their desire to seek Him more deeply, was so encouraging for our hearts. Worshiping with you was a delight, an honor, and a treasure. 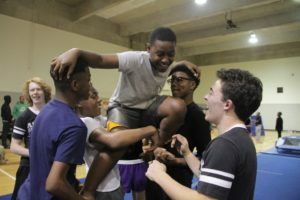 “We hosted 7 members of the Asbury Tumbling Team in our home a few weeks ago. They were a delight and we were blessed by these amazing young people. They were so much fun to get to know and hang out with. We were grateful to Grace Klein for providing so much food! The kids really enjoyed it. All of them were so appreciative of having a place to stay and food to eat – even when our clothes washer broke down. “We were honored and privileged to host 8 members of the Asbury Tumbling Team in our home. We could not have asked for a better group of young ladies. Bethany, Sammy, Rachel, McKenna, Marrissa, Bailey, McKenzie and Jill were wonderful. 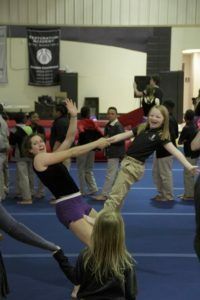 They truly demonstrate the love of Jesus through their tumbling and actions. You have a part of our hearts forever and our prayer is that you will continue to shine for Jesus. May you be blessed as each of you pursue your future.